Make no mistake; artist Reuben Paterson creates unique and dazzling works of art. Operating across a wide range of medium, he is predominantly linked to his use of glitter and diamond dust, on canvas or paper. 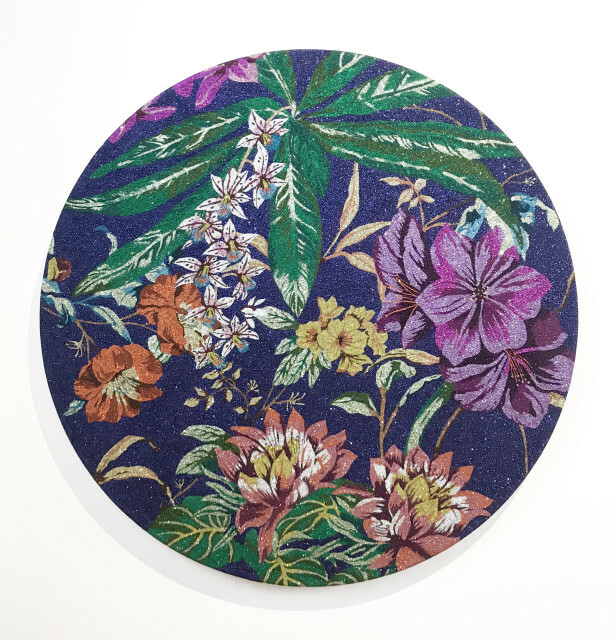 However, any stereotypical idea about of glitter and its usages are joyously manipulated and transformed by Paterson’s unique treatment of colour, design, pattern and texture. Often referencing botanical, retro or Maori iconography, his paintings shine and shimmer, yet contain a deeper space of movement and significance. As we move around his works, we can see beyond and into, a deeper universe of nature, of the unknown and known and of culture and whakapapa. Here, layers of meaning are explored within the swirl of botanical images, each flower a metaphor for life, death, birth, renewal, light and darkness. Some influences that underpin this exhibition include 16th century Flemish painting where black is the background colour of the botanical studies. Paterson is also influenced by his own domestic and cultural life; as well the representation that the colour black has in the culture of New Zealand and beyond. Black often signifies the colour of the ‘other.’ For example it can embody the political movement, “Black lives Matter” or the Black Matter that mysteriously makes up 95 of our Universe and yet remains unexplained. It seems as though Paterson has been surrounded by the botanical throughout his life. His own father was a landscape gardener as is his partner. Paterson too has a garden, where he experiences through nature, the process of birth and renewal, colour and symbol, season and metaphor. Often known to work collaboratively, in 2018, Paterson exhibited in alongside Cook Island tivaevae artist Tungane Broadbent at Bergman Gallery in Rarotonga, where he felt inspired by the relationship he felt with his own Maori ancestry and ‘cultural iconography” of the Pacific. In 2013 he was commissioned by the New Plymouth Art Gallery, The Govett Brewster to create“ The Golden Bearing”; a large golden tree that uses the backdrop of the gallery’s surrounding garden to place the work as if a centre piece in its own composition. As the curator of this project Meredith Robertshaw stated, “If real trees provide oxygen, The Golden Bearing provides sustenance for the imagination”. This could be said of all Paterson’s artworks. Paterson is of Ngati Rangitihi, Ngai Tuhoe, Tuhourangi and Scottish descent. He completed a degree in Fine Arts at Elam University in 1997. In 1997 he won the Moet and Chandon Fellowship in Avize France and in 2005 was awarded the Development Prize in the Wallace Art Awards- the prize being a three months residency with the International Studio and Curatorial Program (ISCP) in New York. His residencies include the Goyang Art Studio Residency: Asia, New Zealand’s Art Foundation 2014 and he has had numerous private and public exhibitions: including the 8th Festival of Pacific Arts Biennale d’Art Contemporian, Noumea, New Caledonia; the International Biennale of Contemporary Art at the National Gallery in Prague; the Asia Pacific Triennial in Queensland and the 17th Biennale of Australia.